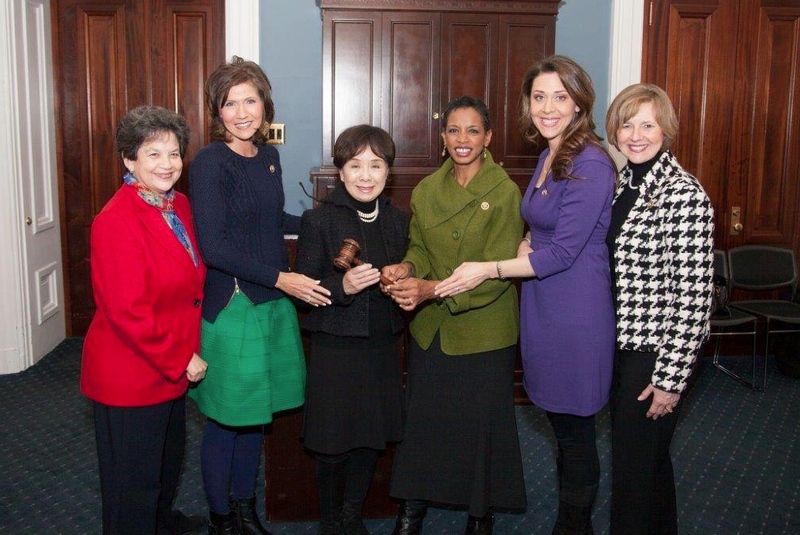 Outgoing chairs of the Congressional Caucus for Women’s Issues pass the gavel to the new leadership team. From left: Reps. Lois Frankel (D-Fla.), Kristi Noem (R-S.D. ), Doris Matsui (D-Sacramento), Donna Edwards (D-Md. ), Jaime Herrera Beutler (R-Wash.), Susan Brooks (R-Ind.). WASHINGTON – The bipartisan Congressional Caucus for Women’s Issues has a new leadership team for the 114th Congress. Reps. Doris Matsui (D-Sacramento) and Kristi Noem (R-S.D.) have been elected by their peers to serve as co-chairs of the caucus. They will be joined by newly elected vice chairs, Reps. Susan Brooks (R-Ind.) and Lois Frankel (D-Fla.). The Congressional Caucus for Women’s Issues began in 1977 with 15 members. Now, with a record number of 88 women serving in the House, the caucus continues its mission of working in a bipartisan fashion to improve the lives of women and families across America.